Padmashri™ is an Indian business enterprise, involved in manufacturing and marketing of premium quality paintbrushes across India. We also have the distinction of being the first paintbrush manufacturer of India to export Dupont® filament paint brushes to international markets. Our company was established in 1974 and we have been rated as one of the premium marketing companies of various consumer products. Our long term vision and technological innovation of Dupont® Filaments has brought us to the field of paintbrush manufacturing. Our advanced production facility coupled with modern management concept since inception has enabled us to offer finest quality paintbrushes to the market consistently. 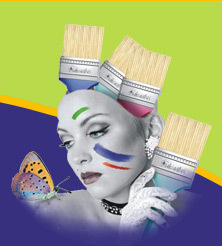 Motto of our company is to offer "High Quality Premium Paintbrushes to the Consumers at Affordable Prices". To realize our objective of total customer satisfaction, we have ensured our organization is certified for ISO 9001:2008 . Our focus on quality and product checking has ensured that every customer is a ‘happy customer’. We are committed for consistent Quality, Supply, Pricing and Long term relationship. Our product range covers a wide spectrum of professional brushes from 6 inches to ½ inch suitable for various markets and brushing needs. All our brushes are made with very high quality raw materials viz. Treated rubber wood handles that are highly durable or acupuncture PVC handles to reduce painter’s wrist pain. Our brushes are 40% lighter and the life is 5 times more than an ordinary animal hair brush. They are easily cleanable, offer uniform and perfect painting and can be used with oil, chemical or water based paints. Keeping in mind, our large customer base and feedback from our valued customers, Padmashri has moved into a larger manufacturing segment and shall introduce indigenously manufactured products to serve evolving demands of the industry.